IP Messenger is a pop up style LAN message communication software for multi platforms. It is based on TCP and UDP/IP. This software does not require server machine. Copyright 1996-2019 SHIROUZU Hiroaki All rights reserved. Copyright 2015-2018 Asahi Net, Inc. All rights reserved. Copyright 2018-2019 FastCopy Lab, LLC. All rights reserved. 1. Redistributions of source code must retain the above copyright notice, this list of conditions and the following disclaimer. THIS SOFTWARE IS PROVIDED BY SHIROUZU Hiroaki, Asahi Net, Inc., and FastCopy Lab, LLC. ``AS IS'' AND ANY EXPRESS OR IMPLIED WARRANTIES, INCLUDING, BUT NOT LIMITED TO, THE IMPLIED WARRANTIES OF MERCHANTABILITY AND FITNESS FOR A PARTICULAR PURPOSE ARE DISCLAIMED. IN NO EVENT SHALL SHIROUZU Hiroaki, Asahi Net, Inc., and FastCopy Lab, LLC. OR CONTRIBUTORS BE LIABLE FOR ANY DIRECT, INDIRECT, INCIDENTAL, SPECIAL, EXEMPLARY, OR CONSEQUENTIAL DAMAGES (INCLUDING, BUT NOT LIMITED TO, PROCUREMENT OF SUBSTITUTE GOODS OR SERVICES; LOSS OF USE, DATA, OR PROFITS; OR BUSINESS INTERRUPTION) HOWEVER CAUSED AND ON ANY THEORY OF LIABILITY, WHETHER IN CONTRACT, STRICT LIABILITY, OR TORT (INCLUDING NEGLIGENCE OR OTHERWISE) ARISING IN ANY WAY OUT OF THE USE OF THIS SOFTWARE, EVEN IF ADVISED OF THE POSSIBILITY OF SUCH DAMAGE. To uninstall, run uninstaller(setup.exe) in Start Menu. Left Single(or double) click on the icon opens a Send Message window. Right single click on the icon opens IPMsg menu such as setting, absence mode, view log, help, or etc. If [Seal] is checked, it will be sealed message. If [Lock] is checked, it will be locked message. The receiver must use receiver's own password to open a locked message. If logging setting is enabled, send/receive images are saved in ipmsg_img sub-folder of logfile folder. Select embedded images and show context menu, it can be saved a selected image to a file. To capture display (v3.3 or later), push camera button or select in the menu that under "refresh" button. Area specified desktop image (that can be modified by marker) can be pasted to Send Message Window and it can be saved to PNG file. Send Message Window is minimized at starting to capture, but this behavior can be changed by settings. 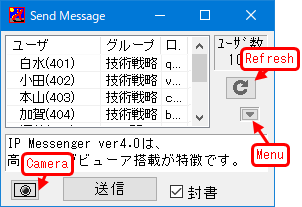 The order of Send Message window header item list can be changed by Drag & Drop. Right click and select "Size/Font/Pos Setting" for saving order. Right click on the window and select from the menu: Sort/Filter, Group Select, Search User Ctrl-[F], File Transfer, (Folder)Transfer, Save List Header, Font Setting, Size Setting, Fix Position, Disp Setting. Sort/Filter display order priority Sort priority is from small to large number. Right click on the window and select from the menu: Font Setting, Size Setting, Fix Position. If you receive a message with an attachment, then an attachment button will be displayed. Folder transfer data can't be overwritten. It is used most strong way that is supported by sender and reciever. It has "Marker", "Favorite", "Comment" functions. Open png(embedded images) file folder in ipmsg log folder. Open AutoSaved Folder for attached files/dirs. Import(or remove) ipmsg text log files for the LogViewer. If text log format is too old, it may not be able to separate username/hostname/uid/IPaddress. Load log-DB file(ipmsg.db) to OS cache for improving search/show performance. Vacuum/Reindex log-DB file for reducing size and improving search performance. Reverse the message show order. To add marker or modification will reflect all viewers. Add self memo like a message. Open Tips section in Help. Then, it will be auto scroll mode and this button icon will be broken line arrow. If it is pushed small pen button, it will be changed manual user search. Start realtime string search and jumping to a message that contains the string. If it is pushed return key, jump to next searched message. If it is pushed return key with Shift key, jump to previous searched message. If it is checked "Check mark", narrow and show only hitted messages. Complex search: "AAA BBB" means to search the messages that contain both "AAA" and "BBB". "AAA OR BBB" means to search the messages that contain "AAA" or "BBB". The number of unopened messages is 300. If it is over, New message can't be received. Show the date of send/received message. If it is pushed, narrow "User" messages. If it is right-clicked, reply/etc menu will be shown. If it is received a sealed message, it will show "Unopened" mini button in the right-top of "User" button. If it is pushed, then the sealed message will open. If a sended sealed message is not opened, it will show "Unopened" mini mark in the right-top of "User" button. If the message is opened, it will be hidden. If it is pushed a Favorite Mark in a message title, the message will be registered as "Favorite". And It affects results of narrowing Favorite button in toolbar. Select "Reply ((== title dobule click)", "Copy message", "Modify Header", "Edit Message", "Delete Message", "Add Comment" menu items. Embedded(inline) images is shown as thumbnail. If it is clicked, it will be expanded. If it is double-clicked, the application that associates ".png" extension will open it. If it is right-clicked, it can be selected to add comment. If comment area is clicked, then a dialogbox for EditComment will be opened. It can be selected "Copy", if selected string area is right-clicked. It can be selected "Search Message", if selected string area is right-clicked. It can be selected "Google Search", if selected string area is right-clicked. Ctrl-[V] is pushed, "Image" can be embedded from clipboard. Ctrl-[V] is pushed, "Comment" can be added from clipboard. Settings Dialog can be opened from right-click in tasktray icon. Input new group name or select group name in pulldown menu. 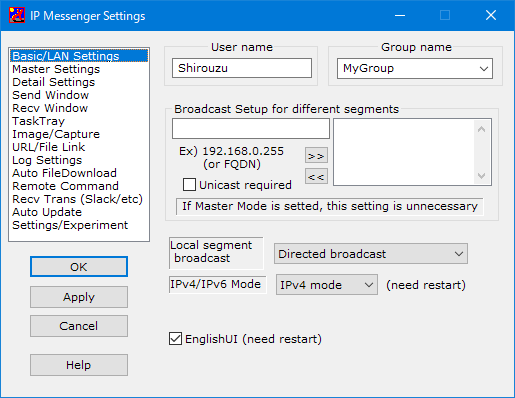 Broadcast setup for different segments If you want to detecting diffrent segment members, it requires broadcast settings. Directed broadcast Listing all IPv4 addresses that NICs have, and send all directed broadcast addresses for member detection. (ex: OS have two addresses(192.168.0.1/24 and 192.168.100.2/24), send to 192.168.0.255 and 192.168.100.255 for member detection. SiteLocal Send to ff15::979 as multicast address for member detection. LinkLocal Send to ff02::1 as multicast address for member detection. This function is to detect members over routers. 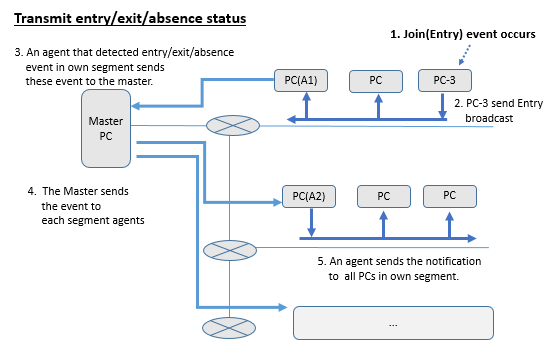 If only one PC becomes a Master in an entire LAN and one or more PC uses/relations the Master in each segments, Auto detecting members function is enabled. Set Master's IP address(or FQDN). It will be received members information from the Master. And it will be accepted to request collecting members in own segment from the Master. A master should exist only one in entire LAN. Basically, Master's IP address should be Fixed address. The master collects members information periodically, and if some change is detected, it send these notifications to each segments. (Refresh period can be setted in "Refresh Intervals (min)". 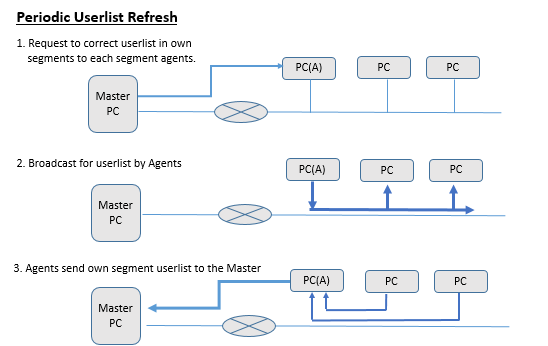 default: 3min) One or more PCs that Use/Relate to a master(=Agent) in each segments are required. Toast Notification Open Windows toast notification settings. (This settigns overrides the above ipmsg settings. Notification Area Icon Open Windows notification area icon settings. Inactive users are shown as gray in the send screen. Show at the end Show inactive users at the end of the user list. Priority users only Show only inactive users with priority settings. Prevent missend Confirm addressee changed. QuoteStr Specify quote string at replying. We recommend not to modify it, because it affects the fold action in the LogViewer. One click open (only viewer) Open a link by single click in log viewer, and open a link by double click in send/recv window. Link targets are only URL Show only URL-link, not File-link. LogFile Specify a filename of send/recv message logs. And also, a dbfile(ipmsg.db) for logviewer will be created in same folder. And also, inline image(.png) files will be stored in ipmsg_image subfolder of LogFolder. Limitation by disp priority AutoSave function can be enabled for display priority users. Trasnfer received messages to slack or another server during lock screen. It requires to get the Slack Incoming Webhooks URL. If you want to transfer to another server, it is required to describe URL and POST message. Test Trasnfer test message to slack or another server. If an error occurs, it is written in the text area in right side. #channel/@username Specify #channel or @username. POST Describe POST data. $(sender) and $(msg) are replaced real sender name and real message body. Regularly check the latest version Regularly check the latest version and if new version is released, updating IPMsg. Check the latest version, but no install If new version exists, it shows balloon notification and if click it, the update confirm dialog will be shown. Check Update Check the latest version now, and if new version exists, the button label will be changed "Start to Update"
Don't confirm Windows Firewall settings at start In current version, ipmsg confirms Windows Firewall Settings at starting. And if Windows Firewall blocks IPMsg packet, IPMsg shows "Add to firewall exception list for receive" dialog. Use 2425 port only for UDP with no File(Folder) Transfer. Setting is saved in the following registry key. When changing your registry number, please re-start ipmsg. IP Messenger use 2425/UDP port for member detection and message communication, and use 2425/TCP port for file and image transfer. If those port are blocked by OS or Antivirus software, IP Messenger can't detect other member or can't send/receive file or images. v4.5 or later, special command(ipcmd.exe) is enabled. If ipcmd.exe is used, it can be enabled "get/set absence mode", "send/recv messages", or etc. At startup IPMSG software, you can specify UDP/TCP port number. IPMSG can run at multiple sessions. For example, using [ipmsg.exe 2426] command, you can contact only people who are using 2426 port. You can run as much as you want using different port number. Using more UDP/TCP port number, then 1024 is recommended. For example, Known NFS software uses 2049/UDP. For these report, please send the following information. Software Version, Operating System, problem situation, repeatability. To close a window, Shortcut(CTRL + [W]) can be used. To set display priority settings in right click of userlist is convenience. To use the frequency userlist in right click of userlist is convenience. If it is right-clicked a image, the image can be re-edited. If it is sended with SHIFT + CTRL + right-click, it can retrieve the receiver's ipmsg version. If the refresh button is clicked with Ctrl-key, it is refreshed userlist, but it doesn't remove old entries. If it is right-clicked a image, the image can be stored as a png file. A image can drag & drop to Send Dialog. In the Search field, it can used AND/OR/NOT search. v4.99r5 Fix rare problem that duplicate sending with Send Queue mode. v4.99r3-r4 Fix not to load MemberMaster IP Address. Add "Write logs to a text file" function to log viewer. Fix to prevent send opened-notification packets excessively. v4.98-v4.99 Fix quote positoin settings. v4.96-v4.97 Add the detail settings of Send Queue mode (Delayed Send). v4.94-4.95 Add Windows Code signing to prevent false positive detection in anti-virus. Fix an issue that stopped when receiving a file attached message from an old client. v4.85 Fix an issue that exited members were displayed in member master mode. v4.84 Added display confirmation setting of task tray icon (Win 10). Fixed a problem that the following buttons do not work in log viewer. v4.83 Fix not to show Toast Notification problem in Win10 Fall Creators Update. Add ToastNotification/NotificationAreaIcon Links in Windows ControlPanel. Fix to swap UnOpened area and Fold Button. Fix to exception at reproducing old version's unopend messages. Fix not to show balloon icon in Win7 (v4.81 only). Prevent to show the error message that occurs periodic update checking. Fix to show toast in Win10 Fall Creators Update. Fix to work ipcmd redirect. Fix to close re-send dialog if it is received a confirm packet. It can be downloaded the attached files, even if the sender IPMsg is restarted. v4.70 Add Slack transfer experiment during lock screen. v4.61 Take a measure for DLL preload attack. 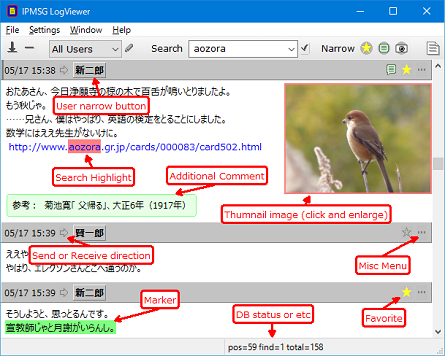 v4.60 Add "Narrowing file attached message" button in logviewer. - Always show a message (that shown only a part of lines) header. Improve Installer/Uninstaller. Fix to restore unopend messages that was stored by under v4.50. Enable to be shown A header of message in Opened/UnOpened Dialog. v4.01 - v4.11 Fix not to reflect a opened information to a logviewer. Fix installer failure when logon name includes multi-byte charactor. Support to confirm that reply-addressees are changed. Support to add to firewall exception list for receive. v3.50 - v3.64 Change bakgroud color to non-transparent for text-marker in image capture. Support auto download option for attached files. Support reproduce message for unopened/hidden message at restarting. Add new marker function(arrow with text/rectangle). Support to paste image by file. Add new commandline message mode(/MSGEX), "\n" in message is replaced to new line code. Support Marker function for captured display image. Support display (area specified) capture. Support detail settings of balloon notifications. Support select users by user(sended) history. Support icremental search for userlist (Ctrl-[F]). Support embedded image in message. Support to choose Directed/Limited broadcast for local segment. v2.00 File/Folder Transfer function support, Encrypted communication path support.